This unique house in Hamilton Terrace is quite out of keeping with the rest of the Victorian ones, and has an interesting history, not only because of its architectural origin but also because of the house’s inhabitants. It was built in 1937-1938, on the site of two original Victorian houses and was the home of ‘Aunt Freda ‘ ( Dudley Ward) and her second husband the Marques de Casa Maury. Born Winifred May Birkin, she was the second child and eldest of three daughters of Colonel Charles Wilfred Birkin (fourth son of a British textile magnate or lace king of Nottinghamshire,Sir Thomas Birkin, 1st Bt) and his American wife, the former Claire Lloyd Howe. 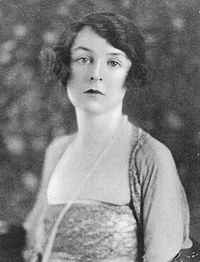 “ Freda” Birkin was twice married, first 9 July 1913 (divorced 1931) to the Rt Hon William Dudley Ward, Liberal M.P. for Southampton. They had two daughters, Angela and Penelope , and though her first husband’s family surname was Ward, the combination “Dudley Ward” eventually became their official surname. She was the mistress of the Prince of Wales from 1918 to 1923, after which she remained his close confidante until 1934 when their friendship was ended by the beginning of his relationship with Wallis Simpson. Her second husband was Pedro Jose Isidro Manuel Ricardo Mones, Marques de Casa Maury. They married 20 October 1937, and divorced in 1954.
took up residence in 1938 at 58 Hamilton Terrace, a new house commissioned by the Marques in 1937 from the Scottish architects Burnet, Tait & Lorne, regarded as the premier British architectural practice of the decade. The Marques had already used this firm of architects whom he had commissioned to build the Curzon cinema in Mayfair with their architect Francis Lorne as designer. The new house featured in the Ideal Home magazine of September 1938. 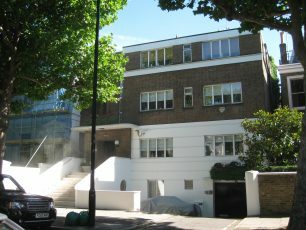 In addition to public buildings, Burnet,Tait & Lorne were credited with a number of private houses in the Art Deco Moderne style, such as the terrace of houses in Wells Rise, off Prince Albert Road, St John’s Wood (1934–1936). Freda was the much-loved aunt of “Bindy”. Born Belinda Blew-Jones on December 23 1921, Bindy – as she was always known – was the daughter of Major Douglas Holden Blew-Jones, of Westward Ho, a tall, handsome officer in the Life Guards with size 24 feet. Her mother, Violet Birkin, was one of three daughters of Sir Charles Birkin, another Nottingham lace king. Bindy had no education, since she was expelled from 11 schools for various wildnesses. Right from the start, however, her extraordinary individuality, handsome good looks, high spirits and original wit began to attract an army of life-long admirers. When she was 18 she met and married Viscount Tony Lambton, son of the fifth Earl of Durham, and embarked enthusiastically on married life. There were four daughters of this marriage, born amidst an active social life and also a political one when Tony Lambton entered politics in the early 1950s as MP for Berwick-upon-Tweed. Amongst Bindy’s friends and admirers were Onassis, Nancy Mitford, David Selznick, Paul Getty and even Bing Crosby . It was at this time that she posed for the famous portraits by Lucian Freud, with whom she watched the racing every afternoon on a flickering black and white television set. In 1961 a longed-for son and heir was born, Ned. But shortly after that she suffered two major accidents, one a go-karting accident which shattered her legs. Then just as her legs were healed, she drove into the path of a lorry on the A1. She was not expected to live , but did, confined to a wheelchair for two years. 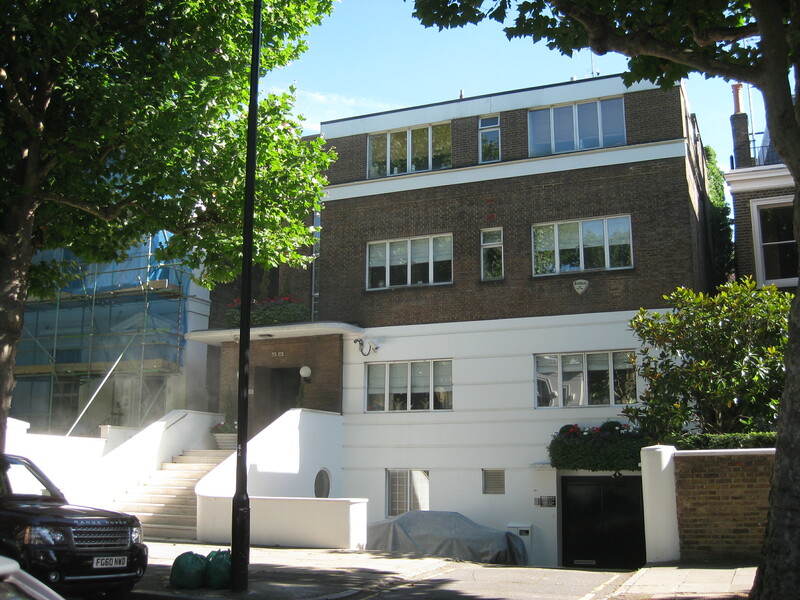 In 1966 she bought the house in Hamilton Terrace which her aunt had had built in the 1930s, a house which has been described as ‘suggestive of an Odeon cinema’. Here Bindy created a beautiful garden with a butterfly-shaped swimming pool. But the family was never happy there – the marriage was beginning to break down. Lord Lambton had succeeded to the earldom of Durham but in 1970 he gave up this peerage so as to retain his seat in the House of Commons. In 1972 when he was Under-Secretary for Defence in the Heath Government he was involved in a call-girl scandal when he was photographed in bed with Norma Levy in her flat in Marlborough Court, Maida Vale. smoking cannabis. The photographs were taken by Norma’s husband and passed to the tabloid press . Lambton was forced to resign whereupon he left the country to live in Italy. And Bindy left the Hamilton Terrace house and went to live in Chelsea. 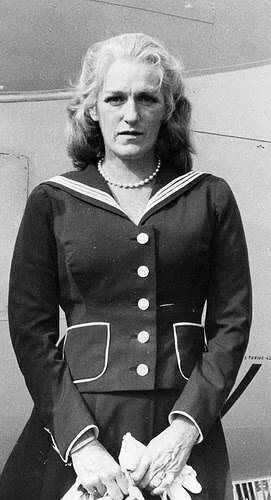 Virginia Spencer Cowles OBE (1910– 1983) was a noted American journalist, biographer, and travel writer. During her long career, Cowles went from covering fashion, to covering the Spanish Civil War, the turbulent period in Europe leading up to World War II, and the entire war. In 1939 she was living, with a butler, cook, ladies maid and house maid at 58 Hamilton Terrace. In 1945 she married Aidan Crawley, journalist, TV executive, editor and politician. Her service as a correspondent was recognized by the British government with an OBE in 1947. After the war, she published a number of critically acclaimed biographies of historical figures, e.g. The Astors, and The Romanovs. In 1983, while travelling with her husband, she was killed in an automobile accident which left him severely injured. This page was added on 09/09/2012.